Renoir's wife Aline had always been among his favorite models. Her fresh, full face and figure appeared in paintings throughout his career. When Aline died in 1915, Renoir decided to create a monument to mark her gravesite. The painter had turned to sculpture several years before, when rheumatoid arthritis made it too difficult to manipulate a paintbrush. With young Catalan artist Richard Guino (who had studied sculpture with Aristide Maillol), he established a working method: Renoir would select one of his paintings, and under his close supervision, Guino would model the image into a three-dimensional clay work. 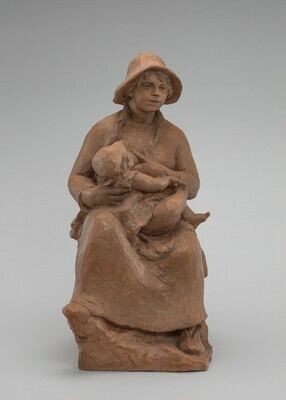 For this sculpture, Renoir used a portrait he had made of Aline nursing their first-born son, Pierre, some twenty years before. In the painting, Aline, dressed casually in sunhat and seated in her garden, looks up from the chubby baby she holds to her breast. Renoir loved her natural, unselfconscious look; he equated this image of motherhood with the constancy and timelessness of nature. 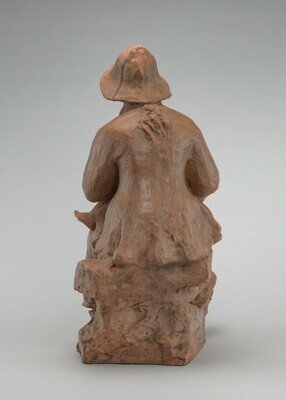 In the end, Renoir did not expand the small terracotta into a monument, instead he enlarged and cast just the head and bust to mark Aline's grave. A full replica of Maternity in polychromed cement was set up in the Renoir family garden at Cagnes-sur-Mer. Claude Renoir, one of the artist's sons; (Galerie Dina Vierny, Paris); purchased 1966 by Mr. and Mrs. Paul Mellon, Upperville, VA; gift 1983 to NGA. Renoir's Women, Columbus (Ohio) Museum of Art, 2005-2006, fig. 44. Sculpture: An Illustrated Catalogue. National Gallery of Art, Washington, 1994: 187, repro.